Triple layers of Horse loving fun! 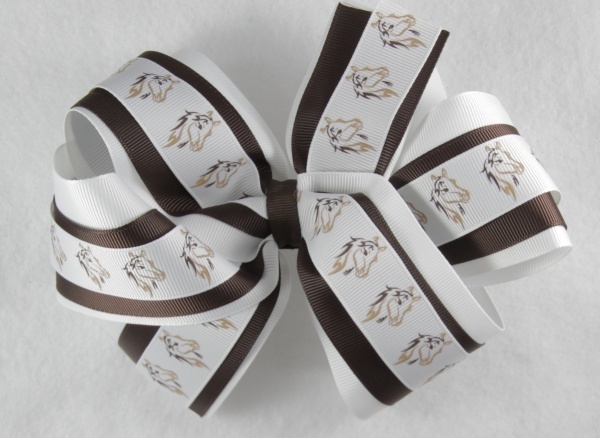 There is a white grosgrain ribbon on top that has horse faces with a flowing mane of dark and light brown coloring. The middle layer is a 1.5" chocolate brown grosgrain ribbon on top of the large 2.25" white grosgrain ribbon. It is wrapped with a 3/8" chocolate brown ribbon and attached to a French clip. Horse lovers will love to wear this bow with all their riding outfits.